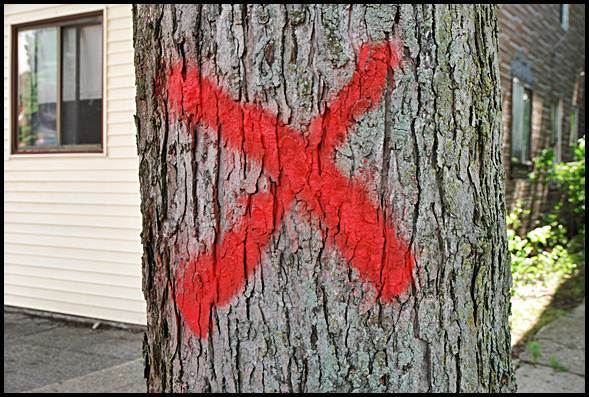 Trees tagged with a red "X" faced being cut down. In response to the city’s tree removal/sidewalk repair project underway, a group of residents have banded together and created a Facebook page in response, called Save Hamtramck Trees. We talked, via email, with one of the organizers of the group, Jessica Frelinghuysen. Review:What do you think about the decision-makers responsible for the tree removal? Frelinghuysen:Ultimately, it’s our understanding that the city’s DPW department is responsible for the management of this project. The criteria for removal is severe. If a tree so much as heaved a sidewalk square by one-half of an inch the tree was marked for removal. That’s not much. The crews came in quickly, and started cutting. They removed as many 6 to 7 trees in a block. Despite the fact that the city said it would only remove about 45 large trees, we estimate that number is far closer to 100. Surprisingly, dead trees and junk trees that should have been removed have been left standing. Residents were stunned. Their streets were in one day abruptly deforested. The project was not carefully implemented. It was forced on the taxpayers without any notice. In other words, no letters were sent to homeowners notifying them that trees on their street would soon be removed. The city did not carry out this project in a considerate manner. The only information given to those in the neighborhood was a red X on the trunk. That’s it. Some assumed that the city would be pruning them and were later stunned when they were chopped down. People need to be notified when a significant project that will affect them is occurring on their street. They needed a chance and an opportunity to protest the removal and discuss other options. Certainly in most cases the concrete could be repaired without removing the tree. There was no careful case by case evaluation. The criteria was cut and dry. The plan steamrolled ahead. It left people without a voice. Even DTE with their gas line replacement work has been more courteous regarding set up and implementation of their project. They sent letter and talked to residents before working on their street. The city simply plowed ahead. Review: What does the group want to happen, ultimately? Frelinghuysen:We want the city to stop the current project. We understand that sidewalks need to be replaced. The criteria for tree removal needs to be more flexible. Residents need to be given choices and opportunities to keep their trees. The city needs to act carefully and give notifications with plenty of time to respond. The administration needs to do it’s best to save as many trees as possible and still flatten our sidewalks. They need to learn to be better stewards of the city. Review:Do you have alternatives to what is happening? Frelinghuysen:The course of action has to be handled with a greater attention to detail. Many trees are not root bound and are only raising the sidewalk 1/2 inch. These panels could be horizontally ground, a sidewalk fix that is inexpensive and considered a permanent fix in cities such as Ann Arbor. In many cases a new sidewalk could be poured around the tree, this requires a little more attention to detail, with the mould being curved instead of a straight cut out. Some of these trees just need to be pruned if the only problem of a specific tree is potential harm to a structure. Other cities have implemented asphalt sidewalks to save their trees, which are more flexible and allow the roots to grow in tandem with the asphalt swelling and shrinking. Some cities pour rubber sidewalks made from old tires. Some of these solutions are common sense and some are expensive. If we save even a little number of the many trees that are slated for removal then we have saved our city’s beauty, history, charm, and shade. We are calling for the city to work in tandem with the Greening of Detroit from the beginning of the project, and work with a community minded local arborist like Kevin Bingham from Singing Tree, a more careful and thoughtful tree service than these cutting companies from West Bloomfield. Review:Do you think your voice is being heard? Frelinghuysen:Facebook has been an effective platform to raise awareness about this issue. Still only a small handful of residents use social media. Many on council don’t have accounts and aren’t interested in it. The mayor though was aware of this page almost immediately and also became part of the discussion. Many in the neighborhood chimed in too. It’s been an effective beginning for the discussion and has allowed a lot of folks to throw in their two cents. Also it creates an interesting document regarding the history of the project. If you read everything that’s been written there you’ll have a pretty good sense for how the project steamrolled through the northeast quadrant of town. If you don’t speak up, it will happen to the rest of the city as well. I am a resident. I live on Moran St. The city has taken down a beautiful maple across the street from me that used to block the window from the neighbor’s house. Now we look at each other and can see into our windows at night. The tree used to block the direct rising sun that now shoots into my house, raising the temperature in my house many degrees, forcing me to use my air conditioner, where the tree’s shade helped before. This raises my monthly bill, of course. On Moran and many other streets the city has left dead trees up and taken down the living. The dead trees don’t raise the sidewalk, so they are allowed to stay. Forget that they can fall and land on someone’s head! If this is a public safety project, then some priorities of the city need to get reworked. Let us know as soon as possible when the new trees are slated to be planted. The city has promised us new trees, but the Greening of Detroit said they were just approached, but no agreement was signed with the City of Hamtramck. Editor’s note: Jessica Frelinghuysen is an artist and teacher at CCS and the University of Michigan in Ann Arbor. Save Hamtramck’s Trees is a group made up of a number of citizens to give a voice to the cause of saving some of Hamtramck’s most beautiful and historical assets, the trees. It is ridiculous that these trees were cut down with such disregard for the aesthetic and quality of life of Hamtramck residents. The DPW superintendent should be held accountable for this ridiculous act. A full investigation into who was involved and what were their motives for cutting down so many trees in such a manner without regard for the residents negatively affected without input. In such an urban environment in Hamtramck all the healthy trees should be preserved if possible. I heard that a tree whose roots were cut had fallen and destroyed a house yesterday 9/12/2013 in Botsford Street and Mckay. Hopefully Platinum Landscape had insurance for the work that they did, or would the “city” pay for the damages. Will other trees whose roots were cut start falling over houses now?